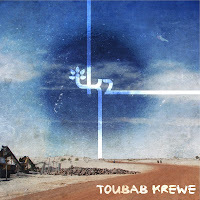 The cover of the new album from North-Carolina-based Toubab Krewe shows a dry dusty African road. At road's edge sit trucks and conveyor belts and rocks apparently waiting to be crushed into gravel. Perhaps this is a metaphor for how your expectations (based on their self-titled 2006 album and 2009's Live at the Orange Peel) will be crushed, and you'll have to move along down the road to keep up with their new sound. And it is a new sound, with far more toubab and less Africa in the mix, starting with the loping opener "Mariama." Sure, there's some wonderful cascading kora in there, but if a vocalist were to join along with the beat and piano, one would expect Tom Waites sooner than Oumou Sangare. The second track, "Nirvana the Buffalo," is defined by surf guitar (we are talking about water buffalo here) with nary an African element to be heard. Other tracks sport more African roots: "Concoba" is built on acoustic strings and complex West African rhythms, while "Beacon" brings in a whole mess of sounds, its heavy bass drum supporting kora along with both West African and Appalachian fiddle styles. The Afro-Latin tune "Carnivalito" sounds like a kora-playing griot taking a surfing tour somewhere in South America. To be honest, there's too much loud electric guitar in this album for my taste, though the festival/jam-band crowd who mob TK's live concerts don't seem to mind it. I agree that there is a lot of electric guitar. But I like the mix between Desert Blues and rock. Great percussion in the second part of the song!